The Chocolate Manor was established in Coleraine in November 2012, and has grown into a thriving bespoke chocolate business. Specialising in unique and delicious printed chocolates, the business now supplies 4 and 5 star hotels, fine dining restaurants, events organisers and PR agencies with handcrafted printed chocolate products that meet their needs, complementing desserts or as event favours/gifts. The retail range features a selection of printed chocolate bars, with a variety of quirky and fun messages and designs – these can be tailored to suit the clientele of the retailer. In 2017 they launched the new 7 disc box set, featuring printed discs and a variety of flavoured chocolate discs, and their new boozy choc pots featuring Quiet Man Whiskey and Jawbox Gin. 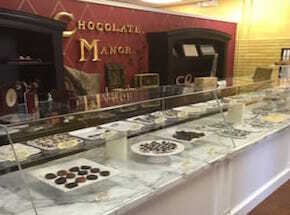 At www.thechocolatemanor.com customers can submit their own personal message to be printed onto the finest Belgian chocolate. In addition, they accept commissions for unique showpieces, such as the 4ft Chocolate Statue of Liberty completed in 2017. Contact them to discuss how we can make your chocolate wishes a reality.